If you're going to San Francisco, be sure to bring suncream, even in November. Last year i visited my lovely friend Lorna, new resident in San Fran. I've been before as a kid with my parents around the age of 14, but couldn't remember anything. San Francisco is actually quite a small place to visit, I only stayed for 5 Days, which were filled with loads of tourist attractions. Flights can be really cheap nowadays, even though we are talking about 12h from central europe (germany). 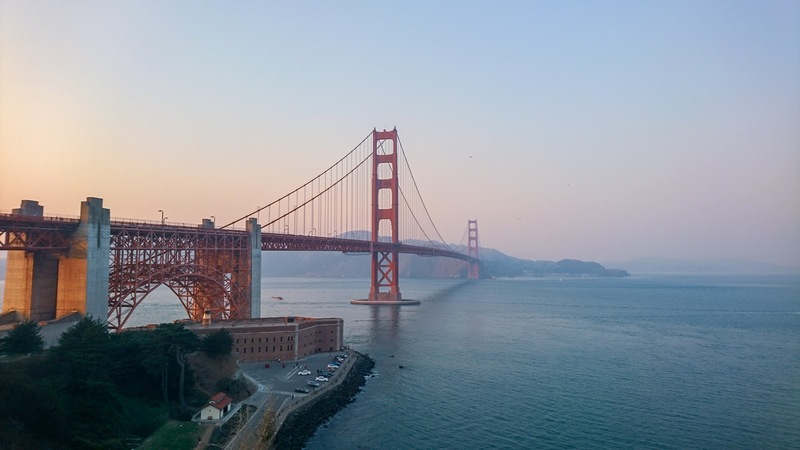 For around 300€ return, i got flights from Stockholm to Munich and San Francisco with Lufthansa. The international airport in San Francisco SFO is located around 30min car-ride south of the city center. The most convenient transport is actually UBER, but you can of course also take public transport towards the city. Usually i love to explore a place while walking around town, but in this city, that is actually quite a tough thing to do. As you may be aware, the town is build in valleys slopes, or mountains, walking takes therefore 5 times more effort. You can take the tube for traveling the eastern side of town. Comparing several undergrounds in Big cities, even being in Paris, this is by far the worst tube i have ever been on. The bus connections above ground are fine, but it is a bit tricky to figure out which bus to take. Most convenient again is uber, but there is also a cheaper, more fun option. Now it seems to invade all big cities around the world, but last year the skip scooters have been such a sensation to me. Of course it can get a bit tricky on steep streets, but otherwise it's such a great way to explore San Francisco. There is several amazing spots, to catch a glimpse of the famous red bridge. In the morning, there is usually a lot of dust around town, especially since there have been the big wood fires around california during my stay. 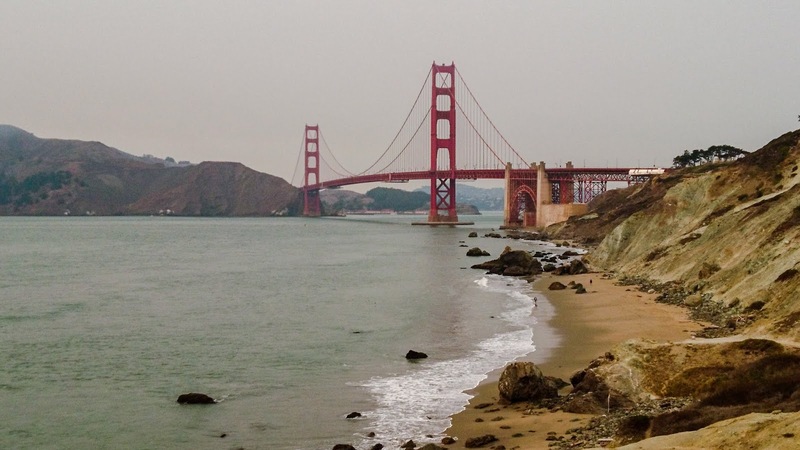 You can get a beautiful view on the bridge from Baker Beach, where you also will be able to spot whales. To cross the bridge, it is really nice taking a scooter or walk on the other side by Crissy Fields. To experience the full thing, I would recommend to get to the bridge in later afternoon, when the sun starts to set. Walk over and watch the city lightening up towards the dark sky. Well of course you should not miss out on this major tourist attraction, when you are here. 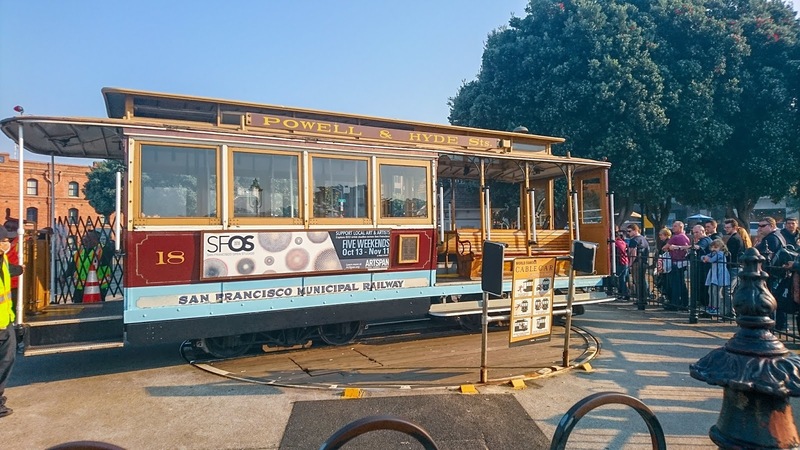 The cable car ride is extremly popular and I would recommend to ride both directions. There are 2 lines, both starting in Market Street, but ending in different points on the coast. I would recommend the line towards Fisherman's Wharf and back. In order to get a good spot on the cable car, it is very wise to walk a bit and not take the very first stop, because there will be massive queues. 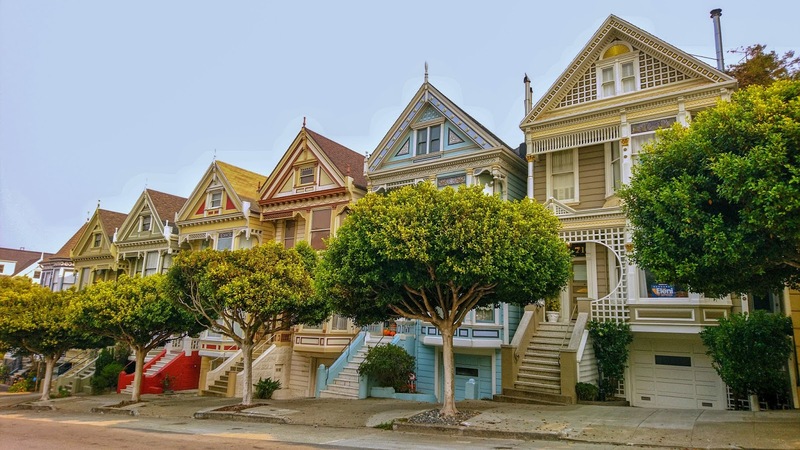 If you take the second or third stop, the chance to get standing up and hanging like in the "Full House" intro, is way higher. 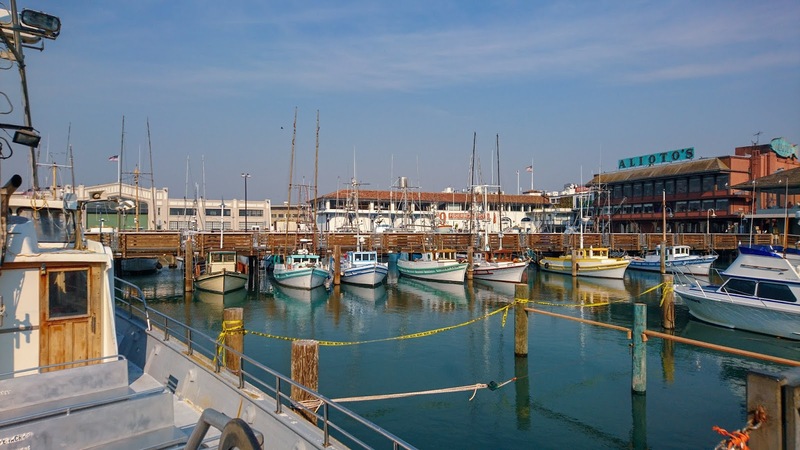 At fisherman's wharf you can eat amazing fish and chips, stroll around and visit local flea markets and visit the very famous Musée Mechanique. Although the entrance is free, be sure to loose some money. In this very old space, you can find almost any gaming machine there ever was. From the original flipper to more modern racing machines, every gamer's heart will skip a beat. 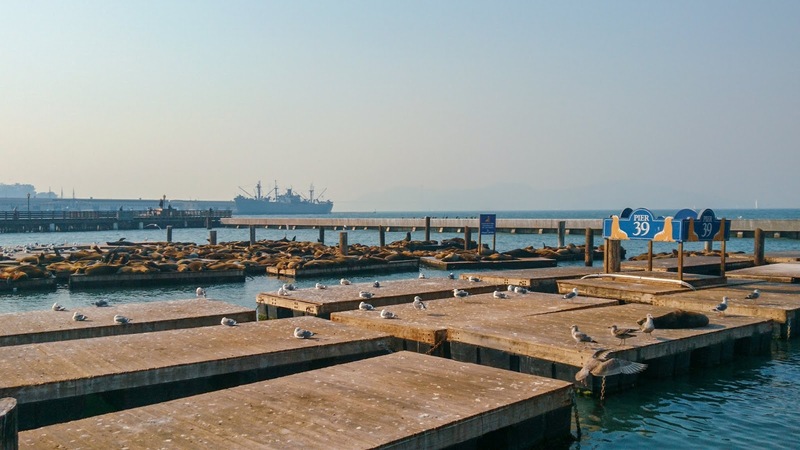 From Fisherman's wharf you can take a scooter or walk towards Pier 39, where you will be greeted by countless sea lions, bathing in the californian sun. Just mentioned the very famous TV show full house, so if you are a kid from the 90s, I hope you have seen the amazing show with Mary-Kate and Ashley Olsen. The original house has actually been removed, but still you shouldn't miss out the scenic view from the park opposite. On a Friday night this is the place to be. To 90s music, you can spin in the church of 8 wheels, which has a wooden plank floor for a great skating time. As this is actual an old church, the acoustic and atmosphere is amazing. Watch the local pros spinning to saturday night fever and grab your friends for a round. 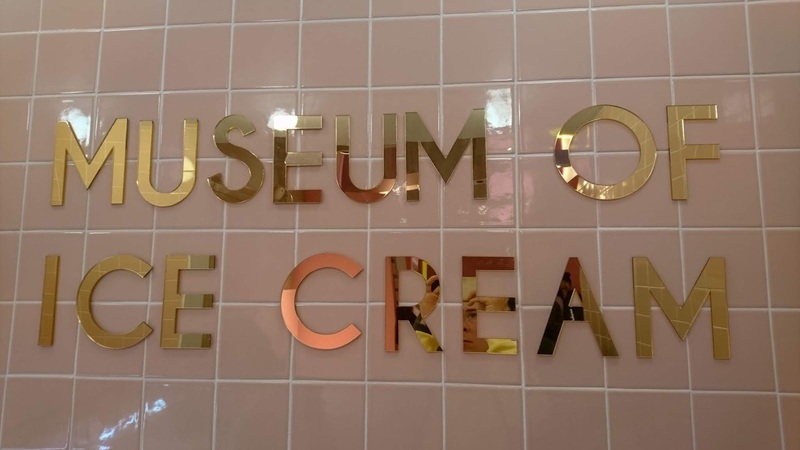 This museum is a great place to be, no matter of age. 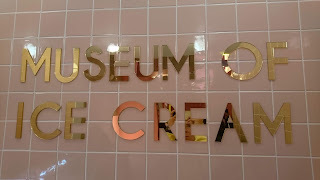 First a temporary exhibition, this became so popular, that now you can visit sweet wonderland all the time. Be sure to reserve a ticket and come with an empty stomach, because you'll get a lot of candy, sprinkles and of course icecream. This is a spot where you and your friends go, to take that special insta moment, whether it is in the sprinkle pool, the pink djungle or in the middle of a thousand yellow bananas. Be sure to check it out. If you like to practice yoga and would like to squeeze in a session during your stay in san francisco i can heartly recommend 2 places i have been to. 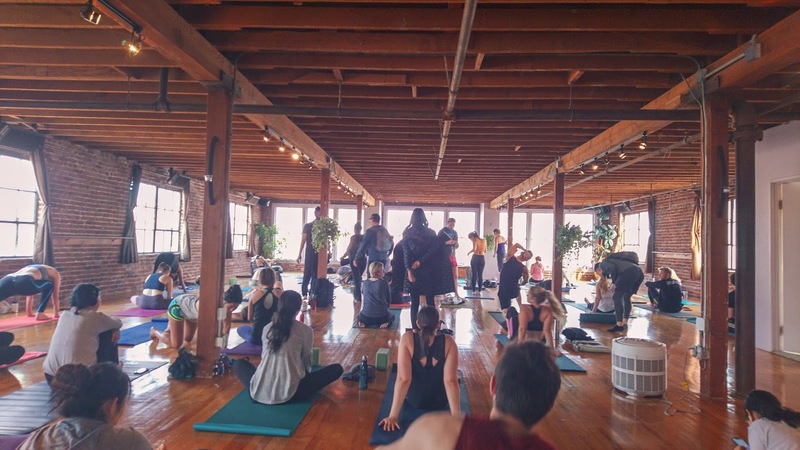 Yoga to the people is a donation based space which offers classes on the upper floor of an old building, with a beautiful view on a cloudless day. The space is huge and filling up quickly, so be sure to come early. You pay as much as you wish when you come and don't need to reserve a spot. 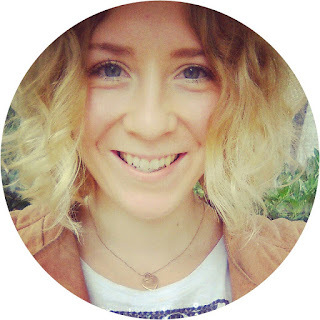 Another great yoga studio is Yoga Tree Valencia, where a friend of a friend teaches classes. This is actually the first professional Yoga Studio I have ever been to, so the experiene of a 2h Vinyasa Class has opened a whole new world to me. Here you need to book in advance and classes can be quite pricy, but they are worth every penny. San Francisco is by far the most advanced place i have ever been, regarding food options for different intolerances or preferences. The best acai bowl with extra californian almond butter can be found a t project juice. They source everything local and have a broad offer of healthy juices and also salads. If you like mexican, try Gracias Madre. Anyhow the best place to eat, even if you are not vegan is Shizen near Valencia Street. Be sure to be very early, as you need to queue already when the place opens. Otherwise you need to make a reservation. There are endless dishes and variations to try, so during my short stay, we still went twice as it was so unbelievable delicious. This trip at the end of the year was all about calming down and finding my inner peace again. Usually people go to Asia or Bali to do so, but the caribbean is quite a nice winter escape as well. 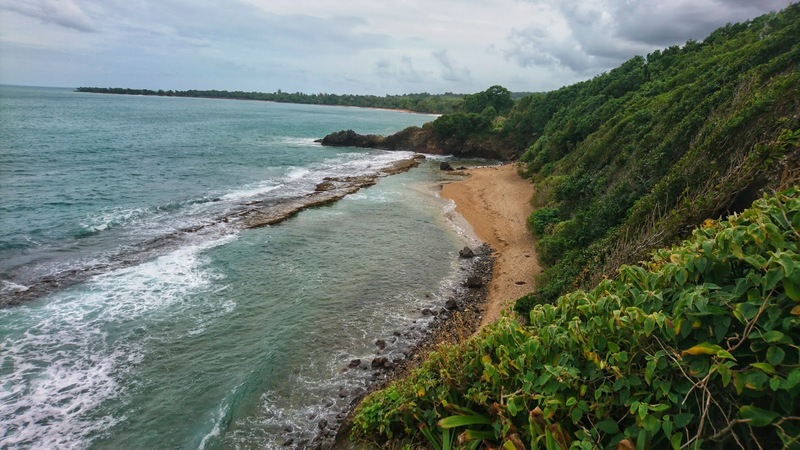 Guadeloupe is the first Island on the western hemisphere, that I visited and I had absolutely no clue, what was waiting for me. Having watched all the Pirates of the Caribbean Movies, I was still not prepared for what I found. 1 month before, when i actually started to plan a bit more of the details, i realised there is absolutely no way to get around without a Car (and a car was a cost i did not calculate. It is indeed very expensive for only 1 Person. Even if you have a car, you have to travel at least 30min to get around. From one end to another it takes around 2,5 hours. The driving style of the locals and the mostly narrow and curvy serpentine streets with steep inclines make it quite an adventurous ride. Especially if you are too young to rent a car with more ps, you will struggle to keep a higher pace then 20k/h on some roads. 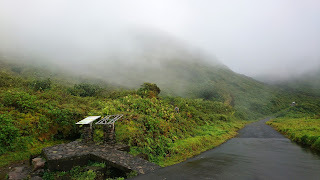 Also heavy rains can suprise you from time to time and at night a jungle tour can be quite scaring. Guadeloupe consists of 2 parts, forming the butterfly shape together. While Basse-Terre, the western part is local and really calm, the easten Side Grand-Terre is very crowded and flooded by tourists. I stayed in an air bnb with a local family, that are renting out 2 flats in their house. Jean-Louis and Veronique are very lovely people and welcome you warm. The apartment is of course very basic, but offers everything one needs. In the night you can hear all animals in the jungle and a dip in the pool is a lovely refreshment any time. 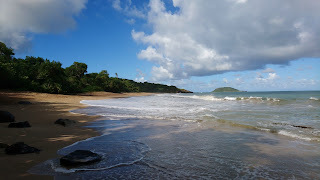 If you need a real retreat, i can recommend this place or any other around Basse-Terre. Having quite some bad experience with eating in tropical countries, i decided this time to cook myself. Since i had an apartment equipped with kitchen and french supermarkets around the corner, it was pretty easy. Nevertheless always buy local products at the supermarket, to support the area. I can really recommend the melons and avocados, such a big difference to ours in Europe. Generally the island is famous for it's seafood, so you will find plenty of restaurants offering lobsters and crabs. Actually they will also be sold to you on the street, still living if you like. So you can even cook your own sea monster at home. There are three main activities, that the island is famous for. Generally the populatin is rather small and towns are tiny. There are some little churches, some small markets, but personally i missed a bit of culture. Beaches Tere are loads of nice beaches on Guadeloupe, while i have only one favourite, which i visited several times, although it took me over an hour by car to get here. There were absolutely no stones, shells or anything else than yellow sand. The waves on that shore were actually quite high, but with a water temperature of 28°c one could not resist to play in the waves. 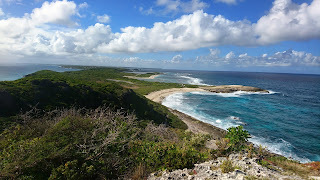 I have visited some beaches on Grand-Terre one day, of which all were very crowded. Additional there were loads of wild dogs in that region as well, which didn't make the sunbathing as relaxing and pleasant. 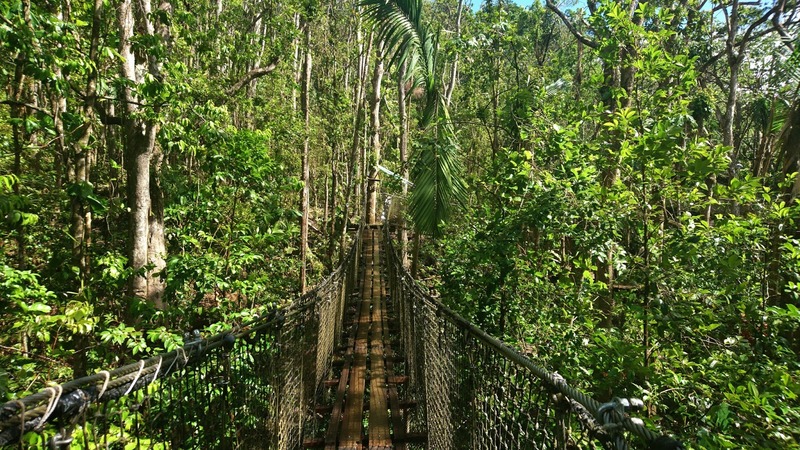 Hiking Guadeloupe's western part Basse-Terre is famous for it's rich forests and hiking tracks. Also there are several waterfalls to see. Nonetheless it takes some effort to get to them. 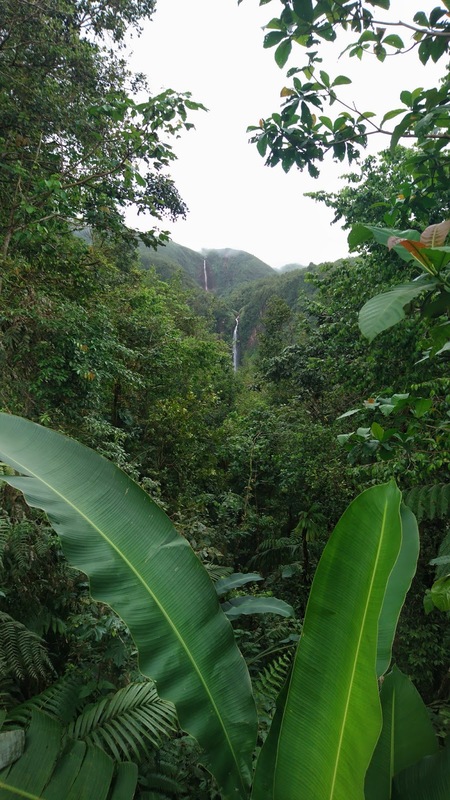 The Chutes-Du-Carbet is a formation of 3 Waterfalls, from which the highest and first one is directly coming from the Volcano la Souffrière. I would recommend to do the third on one day to warm up and the 2nd and 3rd on another day, since you should be really fit for this. I have been exercising all my life, a lot in december and still tropical hiking for some hours made my legs turn into pudding. 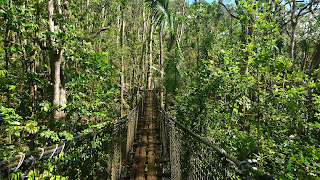 Due to the hurricane Maria, that hit Guadeloupe in September, big parts of the forest were quite insecure and the path was generally flooded and muddy. I would recommend proper hiking shoes, if i would ever go again. Pointe des Châteaux This landmark and eastern outer edge of the island offers the most fantastic view over Guadeloupe Island. On a clear day, you will see the lush forest greens and beaches, combined with the turquoise water in the most beautiful way. 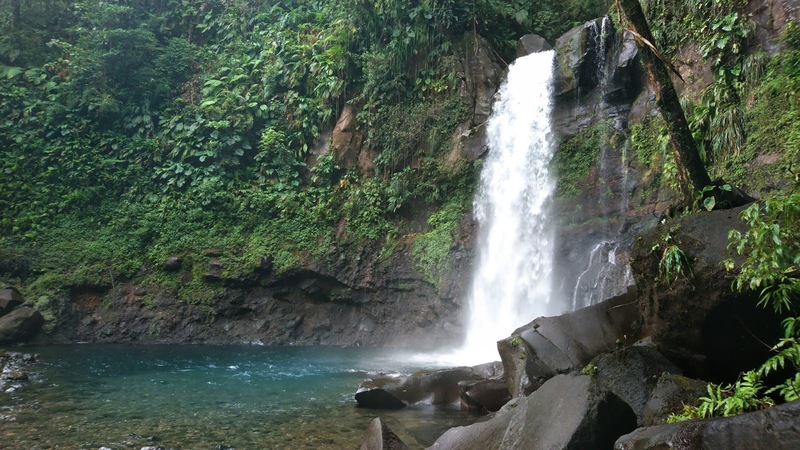 On the road to that point, you will pass a lot of tiny cute local shops and "La Douche" a rocky natural fountain. 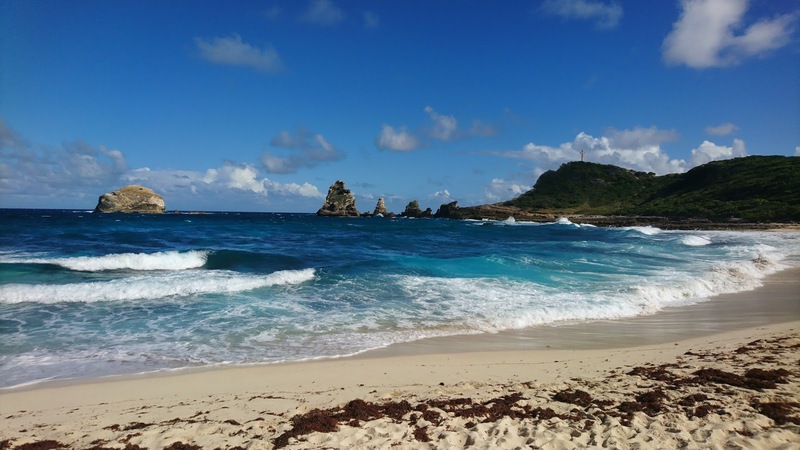 Diving Around Guadeloupe there are several amazing diving and snorkeling sides. Especially the western coast is spread with different diving centers and watersport activities. I went diving with Infini Plongee and it was a real pleasure to dive with Stephane and Fanny, the two owners of the place. It was very close to my air bnb, but also they are connected to SSI and offer an equipped dive for 40€. Parc de Mamelles There are several Botanical Gardens on Guadeloupe, so i visited 2 of them. 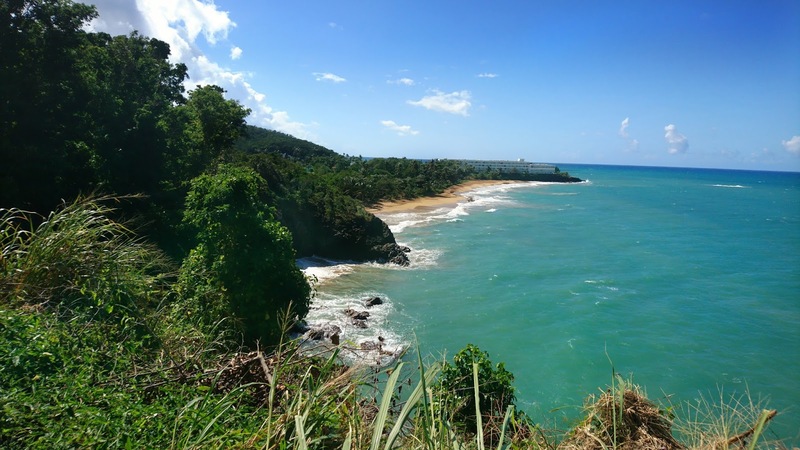 The botanical Garden in Deshaies was to be honest a disappointment. It was quite expensive, 15,90€ for some trees and plants to look at, was too much for me. The zoo of Guadeloupe, called Parc de Mamelles charges a fee of 14,90€ and offers a lot more. There are many different animals shown on a guided track through the rainforest. Also one can explore the most fantastic view high up in the trees on some high rope courses. 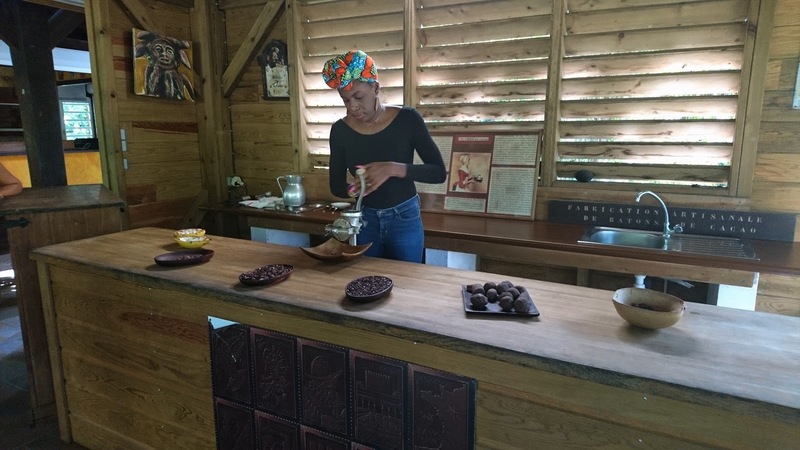 La maison du Cacao There is a cocoa plantage in Pointe-Noire, that you should not miss out on. It is a rather small area, but there is a guidance and plenty of explanations about the original chocolate. The best part of the 7€ tour is the presentation in art of making chocolate, by a local (also in english) and the tasting afterwards. They will offer you plenty different sweet treats. 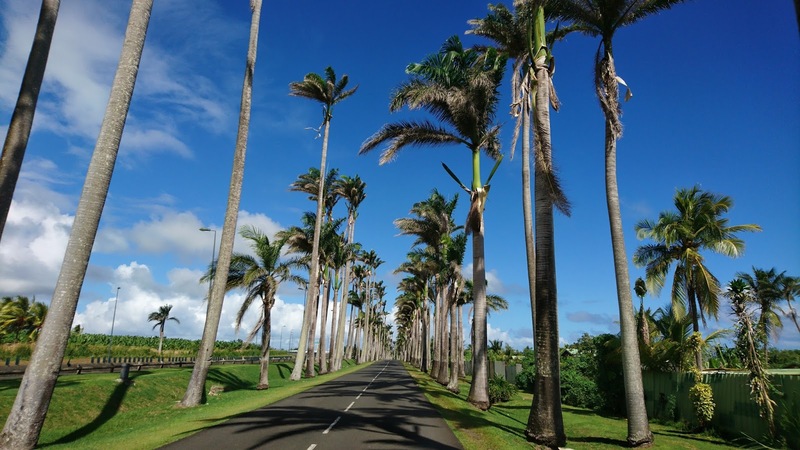 Visit a Distillery Guadeloupe is as the caribbean famous for it's rhum. I wanted to visit the Rhum Bologne Distillery, which was unfortunately closed between christmas and new years. Nevertheless they have a big shop, where you can get high quality old rum at a bargain price. 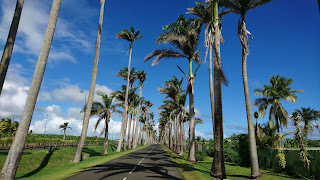 Allée Dumanoir this alley by the sea is surrounded by Palm trees and gives you some californian feeling. As it is close to the Highway, you will pass by eventually, since let alone it is not worth a trip to come here. Guadeloupe belongs to french territory, thence it is a european oversea department. You can pay with euro, which is quite convenient. The official language is french and french only. People speak creol (a dialect), although they will understand your french as well. You will not get far here with english, so either refresh your school french or try to have a dictionnary with you. When filling up petrol at an unmanned station, which is possible thanks to card payment the company will block an amount of 100€ on your card when paying with debit. When they afterwards charge you the actual amount you bought, this amount will be unblocked again, but it can take up to a week. People are generally friendly and quite helpful, nevertheless i felt still a barrier. There has been a long brutal history in slavery, that people will not forget. Still some locals see white people as an enemy. Therefore i would not recommend being outside after nightfall. Every Year has it's ups and downs and although we are already into the new year for quite some time, i still think it's not too late for a re-cap of 2017's best. Naturally the time on vacation has been the outstanding. 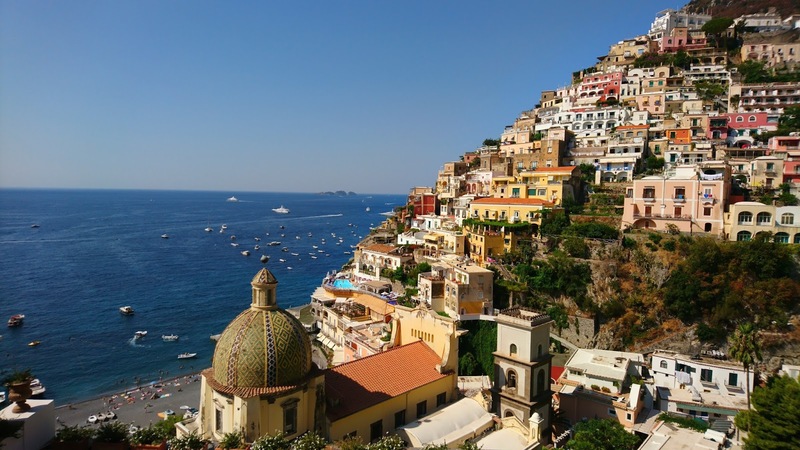 I was very fortune to travel to many different destinations this year and would not want to miss any of these experiences. To escape swedish winter i did a retreat to my personal favourite Canarian Island. 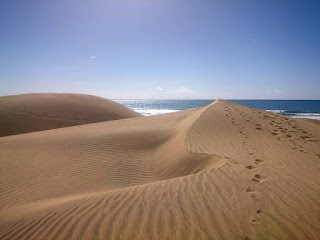 Favourite Spot: The Dunes of Maspalomas. While this was actually exactly what i needed during that time, i will not come back too soon, since these islands are too touristy for me. Nevertheless a lot of sunshine at the start of the year to load up theVitamin D storage. Starting getting more and more comfortable with traveling, i decided to do my very first "real" backpacking trip. Which meant 2 weeks with a 30l Backpack, 3 nights maximum in the same place and so much to see. This journey tought me not only how to pack only the things you will actually use, but also i met so many people at hostels and air bnbs, which enriched this trip so much. 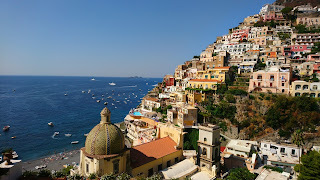 Favourite Place: Positano. 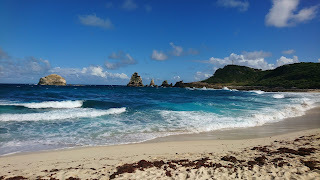 Keeping it quite french, my most amazing winter escape was a 2 weeks trip to Guadeloupe. Hiking in the jungle, chasing waterfalls and having a 1,5km long beach to myself on some days was like a dream come true. Also escaping the christmas stress and new year's eve was quite a great decision. Recently i baked some Sweet Potato Loafs and had some leftover dough. 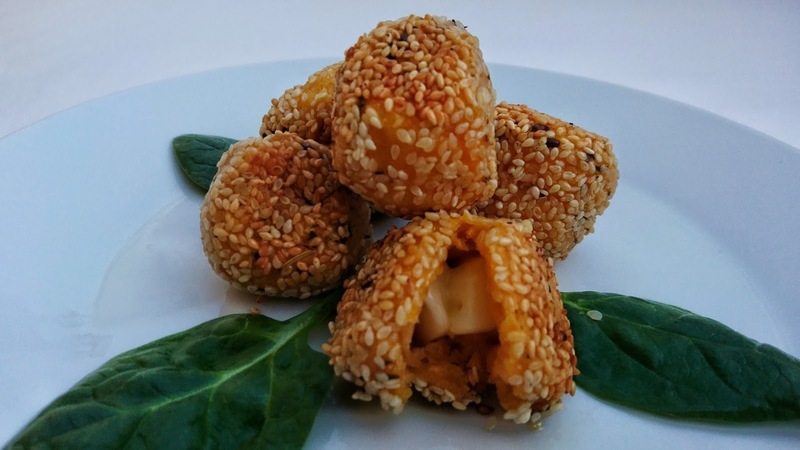 My little experiment ended with the most delicious vegan cheese mozarella balls. 1. Cook your Sweet Potato with vegetable stock and blend until creamy. Let it cool down. 2. Preparing the Dough: Add flour and yeast to a bowl and mix. Let it rest for a bit, for the yeast to start getting active. Add Salt and Oil and Soy Milk and your sweet potato cream. Stir well. The dough should be soft and not sticking to your hands. Add flour if needed. Form a Ball and let it rest in the Bowl, covered with plastic foil. Place the bowl close to your heating and let rest at least 1h. 3. Cut little dices from your vegan cheese, approximately the size 1cm x1cm. 4. Cover the cheese in the dough and roll little Balls. Pay attention that the whole cheese is really covered, otherwise the balls will leak later. 5. Prepare the Crust: Blend a bit of soymilk, flour and different herbs and Salt in a Bowl. Spread some Sesame on a Plate. 6. Roll your Balls in your spiced Soymilk/Flour mixture and afterwards in the sesame. They should be all around covered. 7. Let the Balls rest again under some Plastic Foil. They will rise a bit more. 8. Heat up neutral oil in a Pan. Place the Balls and fry very well from all sides. The crust will turn orange/brownish due to the sweet potato. 9. Serve and enjoy the pop when the cheese comes running out of the Balls. Mentioning this one first, since i have been there so many times, i can't count. Let alone during this trip we have been there 3 days out of 4, at least for one hour in the evenings, just because the atmosphere is so nice. 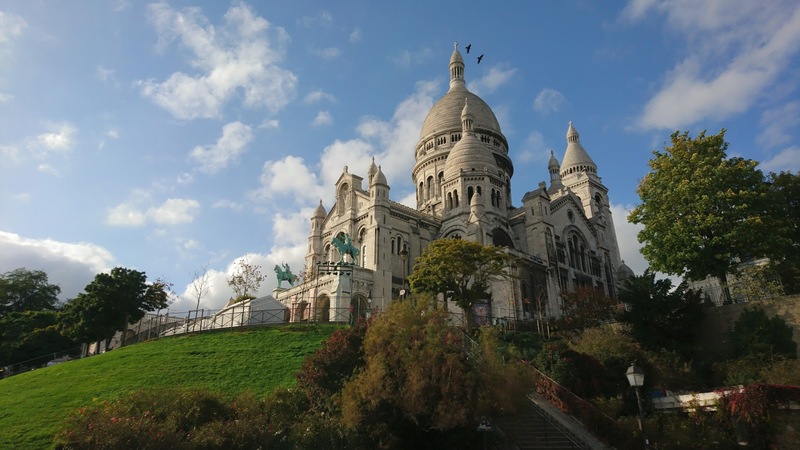 Best to approach Sacré Coeur is to get off at Anvers station downstairs and walk up the tiny road with countless gift shops, towards the cathedral. Then you can either take the small little tram at the left side, or the stairs through the park to get up the hill. When you finally reach the top, you can admire the beauty of the white cathedral in the sunlight from almost any angle. There is one little park at the backside of the church, from where you have a very good view as well. You can visit the cathedral itself for free, while climbing the tower costs a small fee. The view nevertheless is incredible, from what i have heard. I haven't been up there yet. Walking lefthandside of the Cathedral you will find a market place with many artists and painters in summer and another line of gift shops, with magnets and any i (heart) paris souvenir. In the evening the must-thing to do is sit on the stairs in front of the cathedral, facing the buzzing city and listening to some great street-artist performance. One more thing good-to-know is; don't ever give your finger to any of the endless guys running around Monmatre, unless you want 5 braided armbands in 2seconds that you have to pay for. 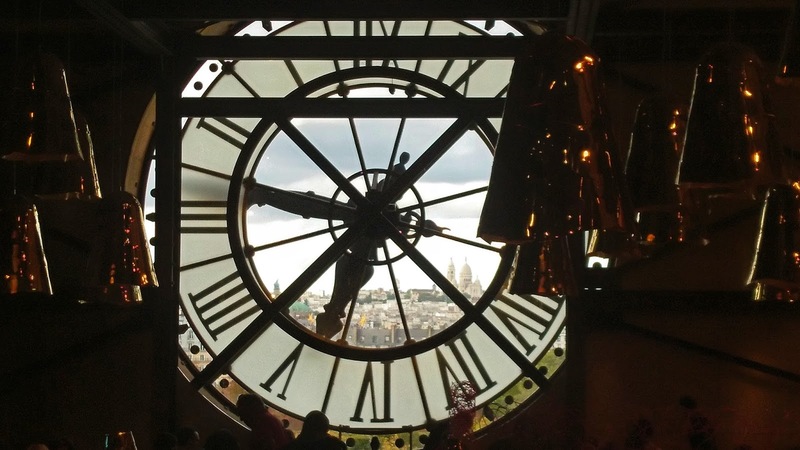 Very famous, not only from the Cinema, this night Club lies in the amusement quarter of Paris. During night time, i would not stroll along these streets on my own, also not with my mum. But already during dusk, the windmill will be lighten up and you can enjoy the fantastic sight of it. To come here is pretty easy, since it's on the same line as Sacre Coeur. The station directly in Front of this Etablissment is called Blanche, so if you come later at night, that is still an option. 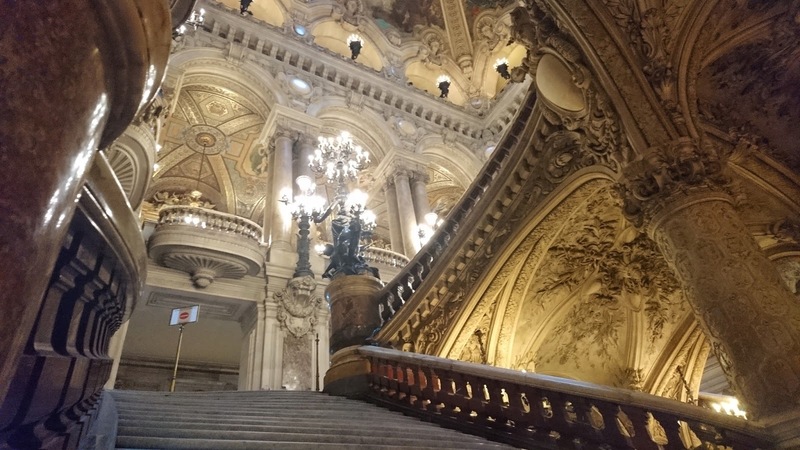 From Moulin Rouge or Sacre Coeur it is only some stops to the Parisian Opera, so whilst you are in the area, definitely stop by. The outside of the building is worth a shot, especially when the sunlight hits the golden statues. This has been the very first time i actually visited the Opera and only due to the recent discovery of my love for classical ballet. 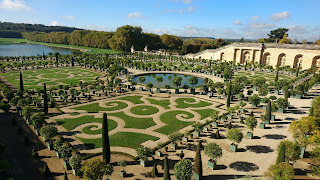 The parisian Opera is a complement within the city to the gardens of Versailles. If you like to feel like a royal for a short time, stroll through the magnificent rooms with sparkeling chandeliers. Also the stairs remind me so very much of Beauty & the Beast. There are several good view points to admire the Tower in it's beauty. 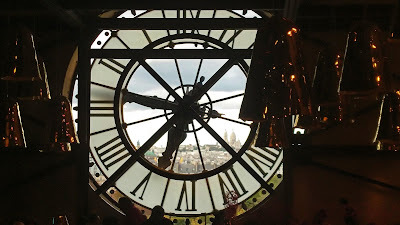 To see it in a large scale, one should go to Trocadero, where you can also see the sparkling lights spectacle at night. Every full hour, the tower starts a flickering light session, sparkling like a diamond. Accessing the actual tower has become more and more difficult, due to strong military protection and strict control. During earlier visits, it was always permitted to go under the center of the tower and take a look up. Nowadways the area around the whole tower is fenced and you can only get closer through security checks and scans. It was by far less busy now, when years ago one had to queue 2 hours to climb the tower. Climbing the Tower is nothing for people afraid of heights, due to the see-through metallic stairs. Also it is quite tough, so better do it in the morning, when you are still fit. Well we all know the famous Disney Movie of Notre Dame that is based on the historical Novel Notre-Dame de Paris by Victor Hugo. This Cathedral has been built for almost 200 years and is by far the most beautiful and detailed church i have seen. The location on an Island in the Seine puts her in the best light from different angles. While the front with the two huge bell towers and its huge 3 doors is ornamented with hundreds of little christian statues, the side roof and high tops are featuring the famous gargoyles. Nowadays one can climb one of the Towers, visiting the sept and it's beautiful windows is free of charge. Notre Dame is the biggest, but Saint Chapelle the most beautiful Church i have ever seen. 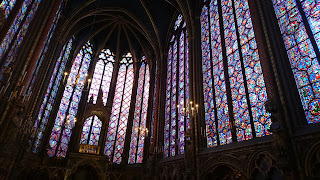 This Chapelle is known for it's huge collection of stained glass. The first time we entered the upper big hall, the sunlight was just rising and all the colourful windows started to sparkle and exlode in brightness. I kept asking myself how so much glass and so little stone can hold the beautiful ceiling. 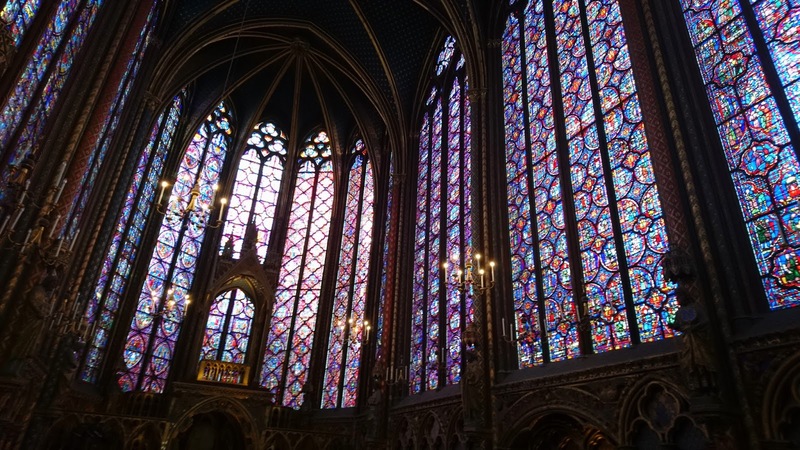 Most interesting is, that every window looks different and one can read big Parts of the Old and New Testamend in the huge framed glasses at the sides, while the rounded end apse shows the Passion and Infancy of Christ. 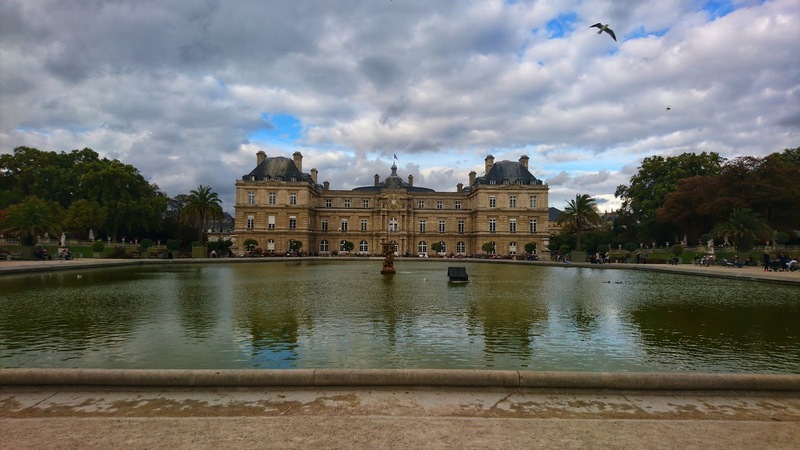 Another maybe less popular spot for Sunday strolls and picknick in Parcs is the Palais du Luxembourg. Lying quite far away from the rest of the touristy spots in the 6th Arrondissement, one has to travel a while south to get here. Little sister of the Palais du Versailles, the palace is used by the state today. I always walked the Champs-Elysées starting at Charles-de-Gaulle Étoile and ending at the Louvre. I don't know why, but generally this is the nicer way to walk. If you get off at the Arc de Triomphe, take the left-sidewalk, since here will be the nicest shops and cafés. On the righthand sidewalk you will find other luxury stores like Louis Vuitton ect. You can drink a latte to go and observe the busy bees around you, walking towards Grande and Petite Palais, through some nice alleys, ending at Place de la Concorde. From here you can continue and enter the Gardens of the Louvre, or you walk to the river, where you will have a fantastic view onto the Musée d'Orsay and the Eiffeltower. Paris most famous and beautiful bridge is located on same latitude with Grand and Petit Palais, close to Champs-Elysée. Most remarkable are the golden Statues at the start and the end, and as well the beautiful decorated statues in the center of the Bridge. Even the streetlamps are a piece of Art. 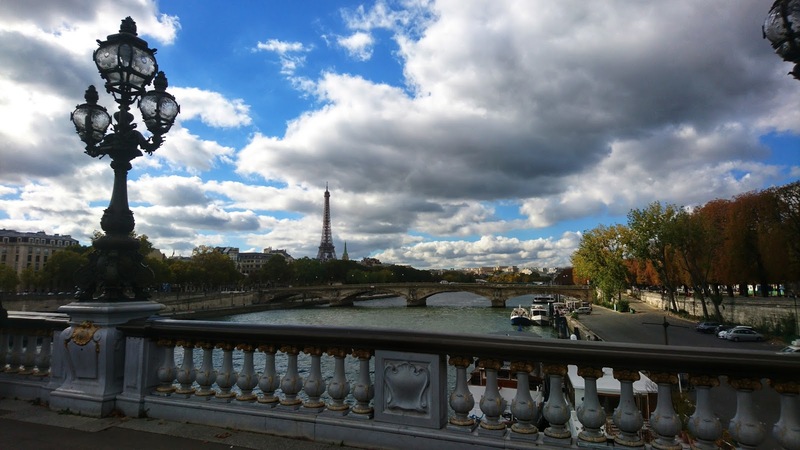 From here you will have a fantastic view over the river, facing the Eiffeltower in the West. Being honest, i have never actually been inside the Louvre, but let alone the outside Facade speaks for itself. To actually visit this huge Castle Museum, one has to plan 1-2 Days and have a high interest in Arts. Time we never had to spare so far. 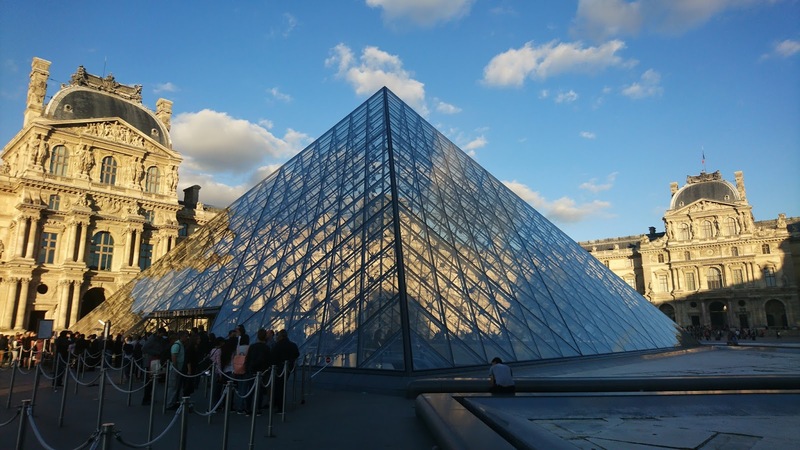 Very famous is the glass pyramid entrance. Furthermore right in front of the museum, one can find the small Arc de Triomphe and on a clear day, you will be able to see all arches within each other from here, even up to La Defense. 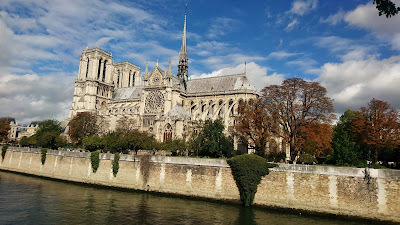 I have been so many times in Paris, but there is still so much more to see. This trip we focused on a mixture between our favourite typical touristic sights and spots we had never been to before. 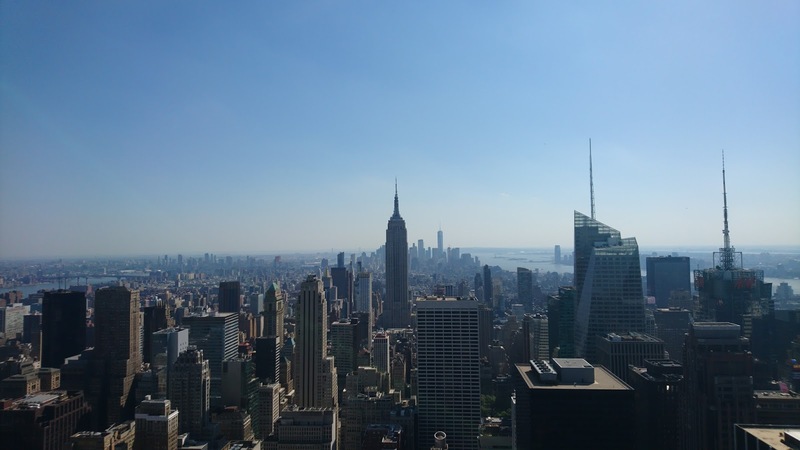 If you really want to see some secret spots in any city you go to, you should put aside your lonely planet (although these are really good) and browse through tripadvisor and instagram. Especially the last one is really good to find less popular and extraordinary sights. All the below spots i found through instagram, so they are gaining a lot of fame recently. Better be fast, before they get overcrowded as well. 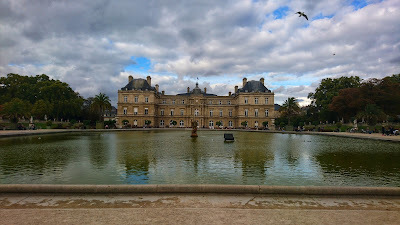 This museum lies opposite the river at the same level as thee Jardin de Tuileries. It has it's own metro station, so if you don't want to walk, it's pretty easy to reach with the yellow big line. To access the restaurant, one actually has to pay entrance to the museum, which is 12€ per Person. 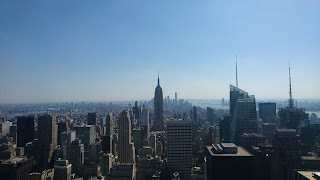 I was getting quite upset, since a musuem visit was not on our plan and paying this much, just for a view and a probably more expensive drink in the restaurant, let me rethink the need of this visit. Anyhow we decided to pay, since we extra came, but very luckily the security guard had heard that we really only want to see the clock. So on our way to the cashier, he stopped us and muggled us in through the gift shop. So we actually got this museum visit for free, but as i have seen it now, it's also worth paying for. It reminded me very much of the MET in New York, although it is much smaller. Basically we only found the clock with the restaurant, but realised afterwards, that there are two, when we had a look from the outside. Nevertheless we could not find the other one, that has the better view. So take your time to explore all corners of this Musuem. Being a real fan of arabian architecture, my biggest wish is to see Marrakesh one day. Nevertheless, this is not an option as a lonely blond woman for now. If you like the flamboyant decorations and arches, you should come to the mosque in paris, lying very close to the Institut du Monde Arabe. 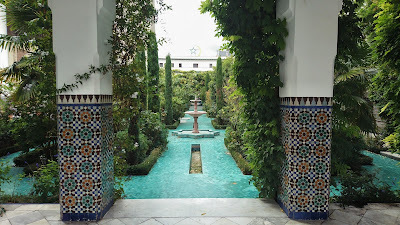 The Complex of the Mosque is quite big and featuring a small café in a beautiful garden, a huge garden inside the Mosque itself, a tower and several rooms for praying. If you visit, please check the praying hours before due to respect. The french kitchen has so many pastries and sweets to offer, but unfortunately all of them contain milk or egg. To not miss out, i was desperate to find the best vegan bakery in town and found this cute little place, that offers a huge varation of cakes and even french croissants for breakfast. Forget about LaDuree, which is overrated and come here instead. To come here, take best the Metro to Etienne Marcel station and stroll along the main roads, that offer so many different culinary treats. I had a version of a Black Forest Cake and a Tiramisu Muffin, both so delicious, that i would have loved to try the whole menu. Unfortunately croissants were already out, since we came at lunch. So on my next trip to Paris, i will try my very first french croissant here. 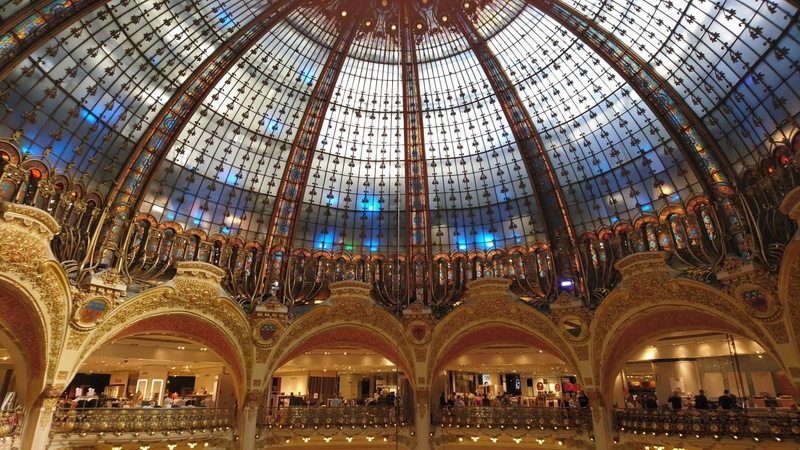 There has always been a restaurant on top of Printemps, but this one has recently been closed for renovation. Another very good view, especially at night can be taken from the Rooftop of the very famous shopping Mall Galerie Lafayette. Half of the platform is though occupied by a bar, so the best view can only be enjoyed when sipping a fancy drink there, but otherwise you get a great glimpse of the Eiffeltower and the Opera for free. 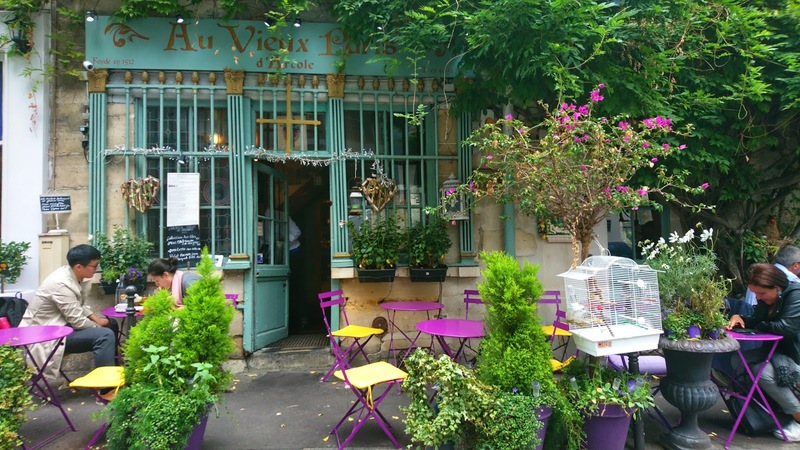 This tiny little hotel/restaurant is the oldest in Paris and lying very close to Notre Dame. The whole fassade is covered by leaves and the colourful furniture outside is placed on the sidewalk, with many little Trees and Plants. While eating typical french cuisine, for a moderate price, you can hear some little canary birds sing in the cage next to you. Also the restrooms are the smallest i have ever been to, guess at earlier times people weren't as big as nowadays. 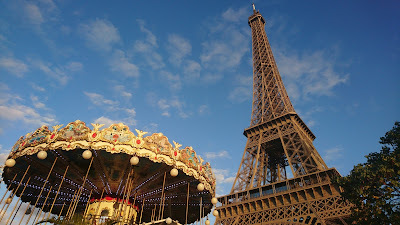 Well i honestly can't say how very often i actually have been to Paris, but this is my very favorite city in the world. Even New York can't match with it. There is one word for each city and Paris word is definitely l'amour. There is something so captivating and beautiful about this city, that keeps me coming back again and again, falling in love allover each time. There are so many things to see in Paris, even after being there so often, i discover new spots each time. While all big cities grow and change really rapidly, Paris still has his old charming character. It is dirty yes, but that's just how you take it. 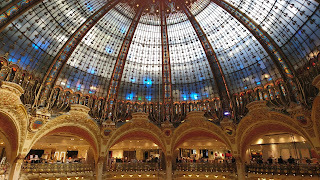 I like Paris most because of it's architectal features, although i am not an expert. The streets of Paris just have their own character, high houses with these cute little balconies, pressed to each other along endless roads, all somehow ending at the Arc de Triomphe de l'étoile. I would say i inherited my love for this city from my mother, who has been even more often than me. As a perfect birthday gift to us both, we decided to go back again to Paris after a long break, nevertheless the present fear of terror. 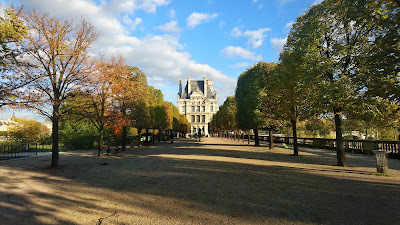 Paris is nice in every season, but i would say that autumn is my very favourite. It is not too hot, still there is a leftover summer breeze and the city is far less crowded. 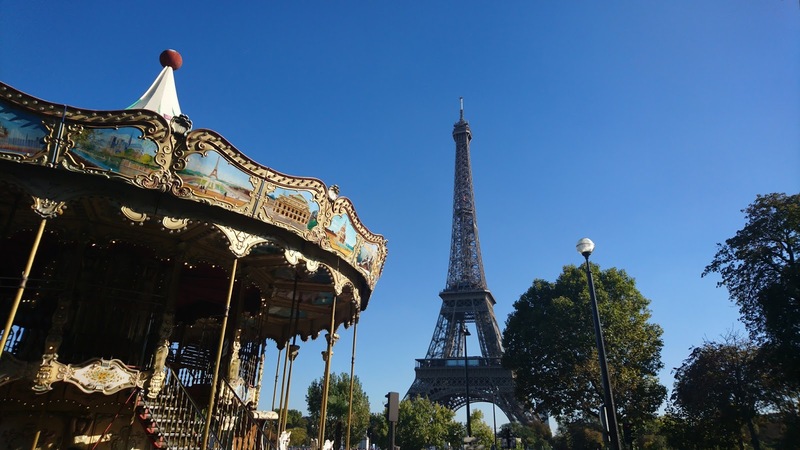 Paris has several airports, but it is still very easy to get into town from each with public Transport. We landed in Charles de Gaulle, north of the City and took the RER to Gare du Nord. There is a very cheap deal called Pass Navigo, which is a weekly ticket for all public Transport in Paris. 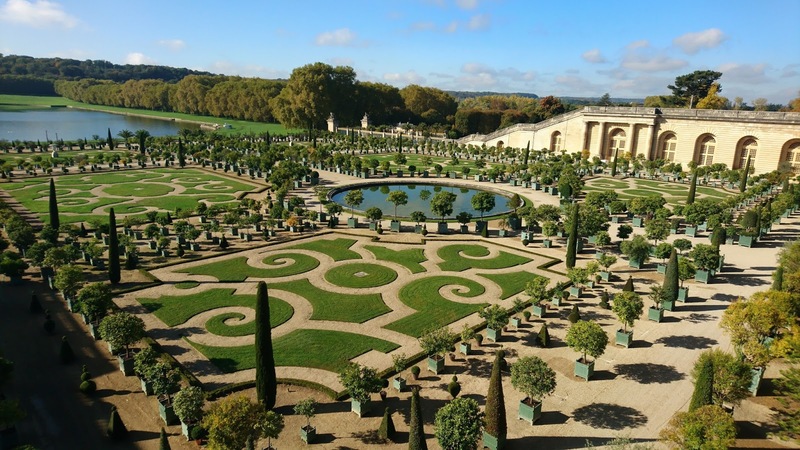 It includes all Zones, thence transport to and from the Airport and even further out to Versailles. This pass starts on Monday and ends on Sunday, so it is only a really good deal, if you come in the start or middle of the week. Otherwise seperate tickets might be cheaper. Regular Transport from Airport to the City costs 10€ each way. To buy a Pass Navigo you need to bring a passport size picture to stick onto your Card, which makes it only valid for you. The price for a week is 22,80€ adding a Fee of 5€ for loading the card first time. If you ever come back (which is for sure) you can just reload your card. I have stayed in many different places in Paris, but for young people i would definitly recommend St. Christopher's Inn Hostel at Gare du Nord. It is far the best starting point to visit the city, being very good connected to public transport. They offer private rooms as well, we had a 2 Bunk Bed Room with Private Bath. It is indeed small, but you explore the city all day (and night), so there is no need for a very fancy Hotel. If you book a private room, breakfast is also included, as well as an Aperol Drink at the Bar every night between 6-7pm. The Bar directly inside the Hostel has quite a negative touch as well, since the music is insanely loud and you better bring some earplugs, if you got a light sleep. French people are extremely polite, especially when living in Sweden, people are just SO nice! They do speak english, but if you make an effort to speak french, they will be even more friendly. The french food is quite sweet, you will find patisseries everywhere and you will not get around trying Pain au Chocolat, Croissants, Eclairs, Macarons et Baguette naturellement!